Aswath Damodaran - Bias: The Achilles Heel To Value A Company! Aswath Damodaran – Bias: The Achilles Heel To Value A Company! All valuations are contaminated by bias, because we, as human beings, bring in our preconceptions and priors into the valuations. When you are paid to do valuations, that bias multiplies and in some cases, drowns out the purpose of valuation. In this session, I take you through a series of what-ifs in valuation to illustrate how bias permeates the process, and argue that the best way to deal with bias is to be open about it, with others and with our own selves. Let me start this session with the. Over the last 30 years our access to data has improved dramatically. Thirty years ago the value companies needed to go find an annual report probably physically perhaps e-mail or forget about e-mail write to the company to give me more information. But I was stuck with very limited data. Today I can download the data in seconds with thousands of companies. We also have much better Marten’s at our disposal. I don’t need a mainframe to run a Monte Carlo simulation I can run it from my PC. So we have more data and better models. Our valuation should be getting better right. But they aren’t. So let’s think about the biggest enemy in valuation. It’s not that people don’t know valuation that they can build models and they don’t have the tools they don’t have the data. It’s bias. Let me explain what I mean by this. When you sit down to buy your company bias shows up in so many different places when you value a company almost never value to the clean slate you bring in your preconceptions your Prior’s about the company what you already know about the company devaluation and it will affect evaluation. In fact some of the things you’re asked to do in valuation often cut in the direction of more buyers. You’re asked to find out more about the company. Read up what other people have said about the company as you read those things. It is going to affect your preconceptions your Pryors about the company you are asked to find out more about the management hangout with them. Learn more about them and God help you if you start to like the managers of a company. It is going to affect evaluation and in many evaluations. The truth is the value gets at first the valuation follows. People decide what they want something to be what they try to figure out a way to get to that number. And if you think about the sources of bias they’re both subtle and direct they’re odd. There’s a part of the subconscious which is if everybody else loves iStock stock it’s very difficult for you to not love the stock. The second is we act as if we knew things we never did. It’s called hindsight bias where once we’ve seen the outcome we think we knew that was going to happen right from the beginning. There’s also the power of suggestion. I’ve seen people throw a number into a conversation without even thinking about it and then that number finds its way into evaluation. When you value a company especially if it’s a publicly traded company this actually shows up in a very obvious way. You value a company and if it’s publicly traded what’s the first number you check the stock price right whether you like it or not. That stock price will affect your evaluation. And finally does the power of money. I’ve told people that once you get paid to do a valuation all is lost in a sense because that is going to affect your valuation no matter how good you are as a person how honest you are that money is going to bias the process. I’ve told people you tell me who pays you to do valuation how much you get paid. I’ll tell you which direction the bias is and how much the bias is. And as you add both bias to the process the last point there is to actually thinking about the input to devaluation. Now very quickly though let me give you some tricks. And these are not tricks that are hidden tricks we all know we’ve done valuation for a long time. 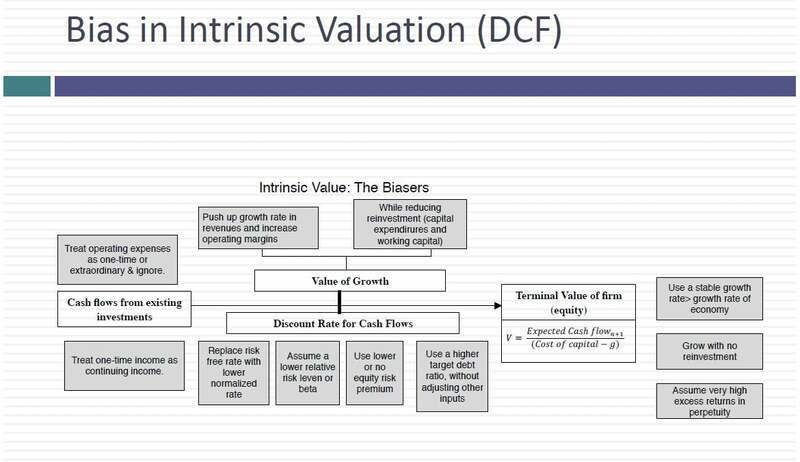 You’re doing an intrinsic valuation for a discounted cash flow value for a company. If you want to increase the value of your company because that’s where your bias leads you we know what you need to do you’d take the existing earnings and cash flows and you try to find ways to make them bigger by doing what. By removing expenses that are really operating expense and you called them extraordinary onetime expenses by counting income that is one time income but you act like it’s an ongoing income using a low effective tax rate because we were able to pay less in taxes last year to increase the value of growth. You push up the growth rate your revenues to push up your operating margin that’s going to give you a higher income in the future and you can and as a companion you make sure you can do all of this without reinvesting very much low capex low change in working capital. When you think about the discount rate and you think about the inputs you want to make the discount rate is lowest possibly want to make the value higher. How can you do it. You can replace today’s risk free trade with what you call a normalized rate a rate much lower than today. That’s tough to do in today’s interest rate environment. But when interest rates were 5 or 6 percent people did this. You can try to act like your stock is a very low risk stock relative to the stock. Were talking about Beta’s you to give it a low beta. You try to use the lowest equity risk premium you can. And you play tricks. You take a U.S. company that gets 80 percent of its revenues from Brazil but you’re treated as a U.S. company and given the equity risk premium for U.S. company and even within the U.S. your biases lead you towards lower numbers. And finally if you are introducing debt you add debt into the process without any other side effects or increase the debt ratio without affecting the debate or the cost of debt. You know what the discount rate filing the terminal value their own games you can play that can make.